Bethel Arts is now accepting submissions from qualified sculptors to participate in the 2017 – 2018 Outdoor Sculpture Exhibition. Now in its second year, the location of the exhibition will be in downtown Bethel on the lawns of the Municipal Center and the Bethel Public Library. The Public Art Exhibition is a dynamic revitalization strategy to elevate the arts community within the area and support our local businesses through increased visibility and pedestrian traffic, as confirmed by the success of last year’s exhibit. All work entered must be freestanding and suitable for long-term outdoor public display within the space provided. The durability of the work and safety of the public will be a consideration for selection. 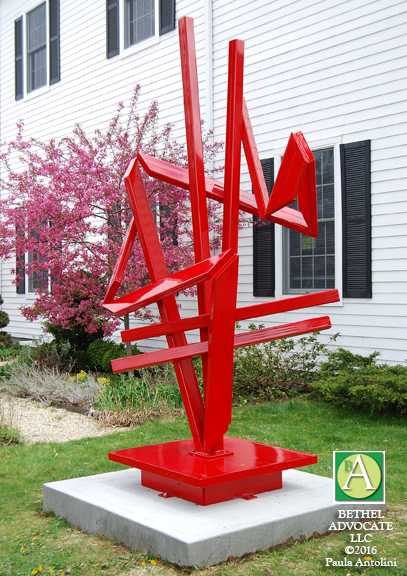 The Bethel Arts Outdoor Sculpture Exhibition is open to all applicants 18 and older. All entries must be original work and of safe design and construction. Acceptable entries may be existing works or detailed sculpture proposals. The selected works are to be on display in Bethel from April 2017 to April 2018.
able to be structurally secured to a 5×5 concrete pad with 3/8 to 1/2 inch anchor bolts. capable of withstanding adverse weather conditions, high winds, extreme summer heat, and freezing conditions. maintenance free for the duration of the exhibition. safe for the general public – no sharp edges, no climbing hazards, no breakable or bendable components, of a height that would not create a balance hazard etc. Works judged as unsuitable will not be considered for the exhibition. Bethel Arts will not cover repairs to damaged artwork during installation, exhibition, or de-installation. Artists are encouraged to carry their own insurance for travel to and from the exhibition. Artists are responsible for the delivery, installation, and removal of the artwork according to the timeline agreed upon with Bethel Arts. Bethel Arts will provide limited assistance and supervision of the installation and de-installation of artwork. Sculptures must be installed no later than April 28, 2017 and removed by April 27th, 2018. Any sculpture that cannot meet the scheduled installation and de-installation dates will be disqualified and an alternate piece will be chosen. Artists may sell the exhibiting artwork during the exhibition period. Bethel Arts stipulates a 25% commission on all sales of exhibited artwork. A printed brochure and online catalog will be produced to promote the exhibition and the exhibited artists. Bethel Arts Exhibition reception will be on May 6, 2017 and all artists are invited and encouraged to attend. All entries must include the following. Incomplete entries will not be considered. Digital Images of Submitted Work. Maximum of three entries per artist. Maximum of three images per entry. Each image should be labeled with image number, artist name, and entry title. If submitting a proposal, artists must submit three detailed, digital renderings of proposed work (jpeg) with a statement describing material, dimensions, and process for completion. In addition, artists submitting a proposal must also submit three images of past, completed artwork. Artist Statement and Brief Artist Biography. Deadline for submission is February 3, 2016 by 11:59 pm. All entrants will receive email notification of results. All entries must be entered through our online entry form, and all questions must be emailed to info@bethelartsct.org. No late submissions will be accepted. Artwork entries will be juried by a committee consisting of local artists and business professionals. The selection process will reflect diversity of sculptural practices while maintaining high standards of professional artwork and safety. January 6, 2017: Call to Artists made public. February 3, 2017: Deadline for email submissions at 11:59 pm. No late submissions will be accepted. February 17, 2017 : Email notification to artists of selected work. February 24, 2017: Contracts and installation requirements due. April 28, 2017: Installation of artwork to be completed by 2 pm on April 28th. May 6, 2017: Exhibition Reception. April 27, 2018: Exhibition closes. De-Installation of artwork.